You are here: Home / School News / It’s superhero time…AGAIN! Firefighter Gula is actually a volunteer Firefighter, which means he has his own job as well as being on call if there is an emergency. He gave us lots of information about how to become a firefighter…you have to be really fit! Some of the emergencies he is called out to, include house fires, vehicle accidents and, you guessed it, cats stuck in trees! 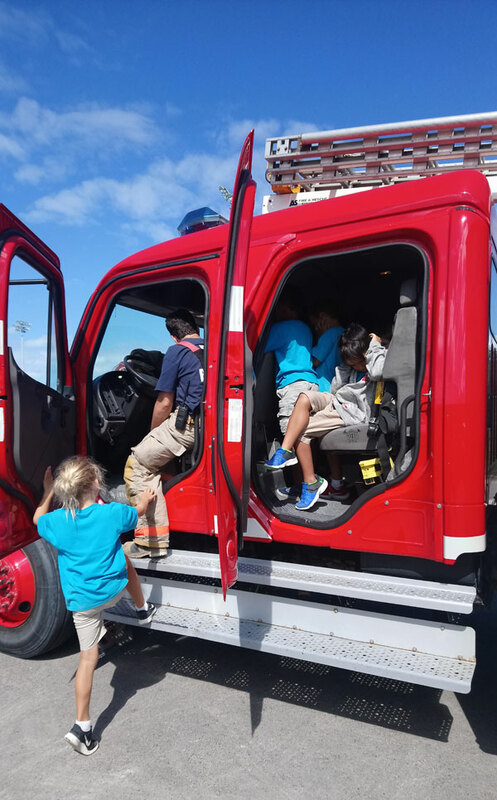 In addition to patiently answering LOTS of questions from the children, Firefighter Gula allowed us to get an up close and personal look at his fire truck. We got to enjoy climbing into the cabin, hearing the siren, looking at the equipment and…. having a go spraying the hose! We had a lot of fun and learnt a lot about how Firefighter Gula and the rest of the Firefighting team, bravely, keep our community safe. Thank you to the Turks and Caicos Fire and Rescue Service for all that you do!